Published February 13, 2015 By Anna T. This post may contain affiliate links. Regardless, I only recommend sites I've researched and/or used and trust. Over the past several months, I've been coming across various “online stylist” jobs. If you are someone who has an eye for fashion and absolutely loves putting together outfits, then you'll want to read on because you actually can get paid to do it from home. 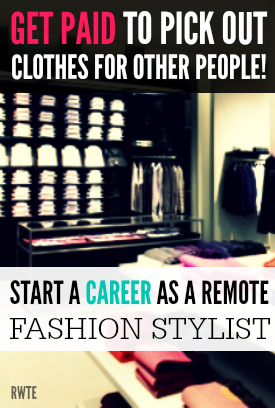 Below are different ways you can work from home as a fashion stylist. The first is a traditional work from home job, while the other two are more of a “start your own business” type of thing. As always, please let me know if there are some other sites I can list in the comments and I'll check them out. Stitch Fix is a company that sends out monthly subscription boxes to fashion lovers. Basically how it works is you sign up, give Stitch Fix information about your personal style, and then every month you get a box full of clothes that one of the Stitch Fix stylists has hand-selected just for you based on your personal preferences. You keep and pay for the clothes you want and send back the rest. It is a fun and very popular service! There are almost always openings for remote work from home stylists on the Stitch Fix careers page, which means you get to be the person who picks out the clothes for Stitch Fix subscribers! These are all part-time positions (15-29 hours weekly), and they are location-based because you're required to attend a 5-6 hour training session prior to working from home. After you've worked as a stylist for 90 days, you may be eligible to start working full-time. And, you get a discount on the clothes you buy for yourself through StitchFix! The locations Stitch Fix hires remote stylists from varies, but at this time on the careers page I'm seeing Minneapolis, MN, San Diego, CA, San Francisco, CA, Pittsburgh, PA, Dallas, TX, Sonoma County, CA, Austin, TX, Los Angeles, CA, San Jose, CA, and Sacramento, CA. So if you live in or near to any of those places, it may be worth applying. You can find the remote stylist positions by going to the Stitch Fix careers page and typing in “stylist” in the search box. You can also read our review of Stitch Fix here. Keaton Row is a company with a mission to help create great fashion choices for their clients. They've partnered with some big names like Nordstrom and Shop Bop to achieve this. You can sign up with them (for free) as a stylist to help pick out great looks for their clients. If any clients buy clothes from the look books you put together, you can earn a commission on the sales. Keaton Row will even give you a free website to help you promote your business. As with any business you start, it's up to you to build up your own client base. However, I was reading through the Keaton Row FAQ for stylists, and it says that clients can browse the profiles of Keaton Row stylists and pick the ones they want to use. So if you make your profile look nice enough on their site, you might get some business that way. Go here to learn more about becoming a Keaton Row stylist. This is another subscription box company that puts out a monthly box of fashion choices for men. Similar to Stitch Fix (listed above), Bombfell does hire home-based stylists. And also unfortunately similar to Stitch Fix, it's location-based. If the job is open, you are required to live in either New York or New Jersey to be considered for the position. You need to be able to commit to 20-30 hours per week of work, and you must either have or be working toward a bachelor's degree. Go here to see if the stylist job is open at Bombfell. This company has recently been hiring remote stylists to help curate their jewelry subscription box. The job listing says it is a remote position, but the San Francisco location is also listed. You would have to just apply and see if you are eligible to work for them even if you do not live in San Francisco. Go here to check out their job listing. My thoughts are that the Stitch Fix opportunity looks amazing and fun if you happen to live in an area where you could attend the in-person training. And the same with RocksBox — if you can do the job and you are local to SF (assuming that's where you have to be), it might be a really fun opportunity. Keaton Row also looks interesting, although the fact you're in charge of finding your own clients means your income won't be a sure thing. It will just depend on how much work you're willing to put into promoting it. But — it's free to join, so I don't see that there's any risk there if you just wanted to give it a try. Good luck! Please comment below if you want to share any other ways you can earn money online picking out clothes for others. Hi my name is Audrey and i have had a passion for anything that involves creation i have made lots of things besides ideas in my head for clothes. Ive made jewlery, pottery , patying ect. My dream is to do something that involves some of my passion for creative things. How can i get my way to the future dream job id like to have? Hello my name is Steven and I am interested in a styling and personal shopper business with men’s fashions do you have knowledge of any business like the ones you have posted with men’s clothing. Hi Becky. I don’t know any personally, but I usually check Glassdoor when I’m looking for employee reviews of companies. There are a few posted for StitchFix on Glassdoor — some of the reviews are from stylists, so you might want to read this – http://www.glassdoor.com/Reviews/Stitch-Fix-Reviews-E783817.htm. Are they hiring stylist from the Philippines? No, unfortunately the companies I have listed are only open in the United States. Hi. I live in Maryland. When Stitch Fix is hiring in the Pittsburgh, PA area, do you think I would be considered if willing to travel to Pittsburgh one day for the training (it said training is about 5-6 hours one day)? That could actually be doable since training is just one day. Wow, this is a dream job for some women I know! It’s a great way to satisfy the urge to go shopping, but instead of spending money a person is making money. Brilliant! Thanks for sharing. It seems like stitch fix is mostly hiring for TX and CA right now. All the other jobs look like they go quick, so this is probably a place to check back pretty often to. There’s also Cabi, another direct sales opportunity. The problem with Cabi and Keaton Row is that since when starting your business, you rely on your closest circle of friends, if you are in a middle to low income group, it’s going to be tough because the items are too pricey for most in that range. I signed up for Keaton row, but the items are never for sure and are poor quality when you direct your customers to the page. It’s to confusing for the consumer. Plus, why buy nordstroms clearance items from Keaton when you can buy the latest from the website at the same cost. I’ll check out the other two though because it would be fun landing a job like this. Good points and thanks for your input!